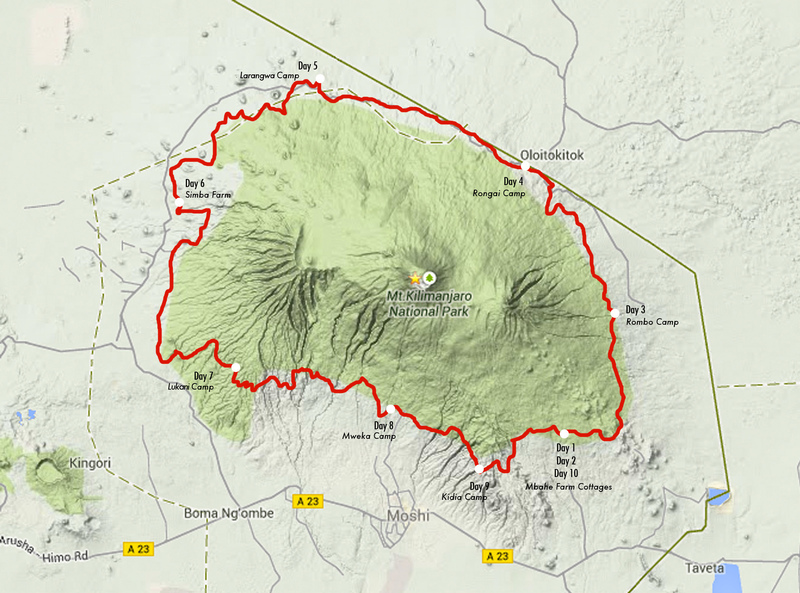 The route circumnavigates the lower slopes of Mount Kilimanjaro over 8 days. You will average more than 30km per day at elevations between 1400 and 2100 meters! The run starts and ends near the Mbahe Village cottages that Simon built on his family’s farm at 1800 meters on the slopes of Kilimanjaro. Distances and elevation +/- approximate. Arrive at the Kilimanjaro International Airport. You will be met by a SENE driver and transferred to Mbahe Village on the slopes of Kilimanjaro. Mbahe will be your base for run preparation and orientation. Breakfast welcome and orientation meeting, followed by a farm tour. Light run to explore the village and mountain trails. Lunch and afternoon rest. Free time to explore the farm, swim in the Moonjo River waterfall, relax with a good book, or just admire the sweeping mountain views with a cup of “homebrew” coffee (grown and roasted on the farm). Dinner and additional run details and logistics. From the official start at the Kilimanjaro National Park Marangu entrance gate, we cross dozens of streams and rivers, many with deep and steep gorges to descend and ascend, while keeping Mawenzi, Kilimanjaro’s second peak, on our left and Kenya’s Tsavo National Park to our right. You will be completely spent at the end of this very difficult first day. The forest thins as we run through a dry and rocky landscape, passing Maasai settlements and with the chance to see wildlife migrating from the plains below to mountainside above. Our campsite at a primary school overlooks Amboseli National Park in Kenya, where the only light comes from the stars above and the few safari lodges within the park below. Exiting the sparse landscape, we skirt Legumishera Hill, which contains a small lake at the summit and is the source of much local superstition. We then run several hilly kilometers along the forest edge between Kilimanjaro National Park and cultivated land. We’ll finish the day at Simba Farm, one of the original European farms in Tanganyika Territory. From the dining area we have spectacular sunset views of Mount Meru. Today is the longest stage. We begin with an ascent into the forest reserve where active timber harvesting continues, then exit to a hot and dry lowland stretch, and finally regain much of our lost elevation up to the verdant southern slopes of Kilimanjaro. Traditionally KSR runners have found this stage and the next to be the most challenging due to their distance and intense climbs. Today we encounter our steepest valleys and ridges above a densely settled area of smallholder Arabica coffee farms that use centuries-old irrigation canals dug along the mountainside. Each village has its own primary school, each with its own distinctive uniform color for the students. Running high above the villages and just outside the national park boundary, our final day brings even more spectacular views and a joyous return to Mbahe Village, where we started 7 days ago. Congratulations, you ran around the Roof of Africa! Celebrate with a leap into the river, hot shower, cold beer . . . or all three!